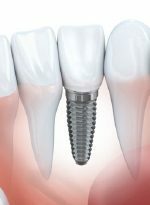 Dental implants are used to replace teeth that have been lost. Through a surgical procedure, these artificial roots and teeth are placed directly into the bone. Implants replace teeth, restore chewing ability and improve facial tissues in the process. 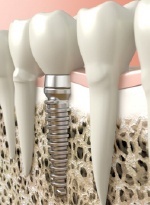 Dental Implants are natural looking, secure and durable, and last for many years. By the time your treatment is complete, you won’t even be able to distinguish your natural teeth from your new restorations. Contact our office today to have your implant restored with a custom crown! Dental implants are often considered to be the most durable and long-lasting option for tooth replacement and for good reason. On average, implants last as long as 25 years and carry success rates as high as 98 percent after a 10-year period. But reliability isn’t the only reason people are choosing them over dentures and bridges. Finally, eating your favorite foods is rarely an issue with dental implants. Tough or crunchy foods like steak or apples are easy to chew, so you can create a diet that matches your lifestyle. Just make sure to practice daily oral care to prevent plaque buildup on your surrounding gums. Dental implants are ideal for replacing teeth in a wide variety of situations. It doesn’t matter if you’re missing one tooth or an entire arch; implants can play a part! If you’re missing one tooth, a single, titanium implant and implant-retained crown are sufficient for replacement. The crown is made entirely from porcelain, a dental ceramic that looks almost exactly like natural teeth. If you’re missing two to four teeth, a dental bridge can be customized to fit with dental implants. Instead of relying on neighboring teeth to anchor restorations like traditional bridges, implant-retained bridges use two implants on either side to hold up to four teeth at a time. 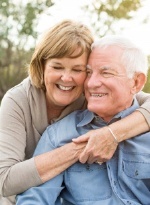 If a denture is not the direction you’d like to go, implant-retained dentures are the perfect solution. By placing four to six implants strategically throughout the mouth, they can hold an entire arch. This effectively replaces an entire row of teeth while still offering a more stable denture in the process. It’s important to note that the amount you pay for implants will vary depending on your needs. For example, those who need an entire arch replaced vs. just one tooth are guaranteed to pay far more. Additionally, those who need preparatory treatments like bone grafts or sinus lifts will also see a higher cost. With that said, dental implants are considered to be a long-term investment that lasts for many decades. Compared to other tooth replacement methods, this makes them the most cost-effective solution for many individuals.